Oxer Lookout was one of the places I wanted to photograph sunrise at Karijini National Park. The lookout is situated at the junction of the Weano, Knox, Red and Joffre Gorges, and offers incredible views down into the four gorges---if you're willing to get close enough to the edge. This particular morning was cloudless, and I didn't think much would happen with the sky during sunrise, so I focused my attention on capturing the gorges with the soft, diffused light that filled the sky just minutes before the official sunrise. 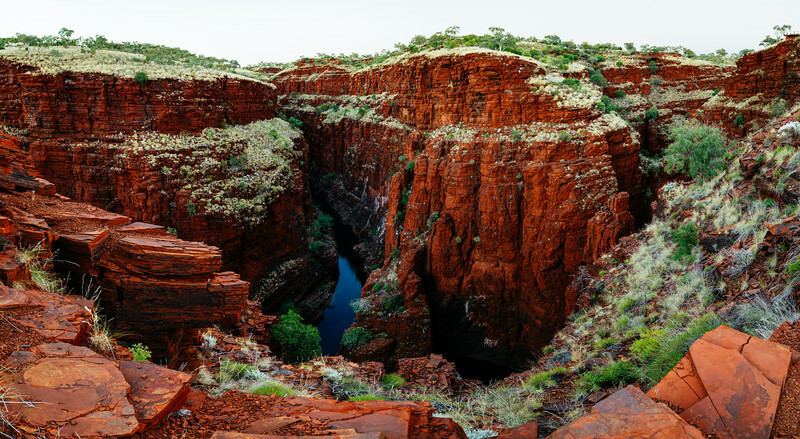 This soft light was perfect for bringing out the ruggedness of the red Western Australia rock that forms the the land in this area, and also for highlighting the differences between the green trees and the near white shrub grass that dots the landscape. One of my main goals in photography is to convey to the viewer the sense of feeling I had when the image was captured. This is one image where I couldn't do that. As I think back on it now, about a month later, I remember feeling nervous taking this picture. It doesn't look like it, but I was very close to the edge of the cliff when I captured this image; and, it is a long way to the bottom. I was far off the official path, precariously close to the edge, and standing on a little peninsula of rock that jutted out into the junction of the four gorges. I knew, rationally, the rock had withstood the test of time and wasn't going to collapse on me, but that didn't stop the heart from beating a little bit faster.